If you’ve hired a recent college graduate in the last year or two, you might be surprised to learn that you’ve hired a member of a new generation: Gen Z. While most marketers are still getting to know Millennials, Gen Z is quickly emerging as the face of young adulthood, with the oldest among them turning 23 in 2019. As they navigate newfound independence, adult decision-making and employment, they’re bringing their values with them into a new spending lifestage that has leading-edge marketers clamoring to understand them – primarily as future customers. However, marketers have an untapped opportunity to leverage their input as employees. If Gen Z is in your target, as employee or customer, it’s essential to create a customer centric culture that’s empowered to prioritize improving the customer experience overall. How to get there? One way is to let Gen Z take the lead, specifically on reducing employee effort. We’ve noticed CX leaders at progressive companies seek to understand the strategic opportunities that connect employee effort and customer centric cultures. Our research shows that reducing employee effort leads to myriad benefits, such as increasing engagement and productivity resulting in more collaboration, sharing, and empowerment to lift CX. Fortunately, Gen Z’s career expectations align with this more efficient employee and customer-centric model. Fear not: unlike Millennials’ focus on rapid advancement by way of self-initiated on-the-job experiences (all while on a flex schedule), Gartner’s Consumer Insights Research Team finds that Gen Z seeks more stability alongside good pay and benefits. 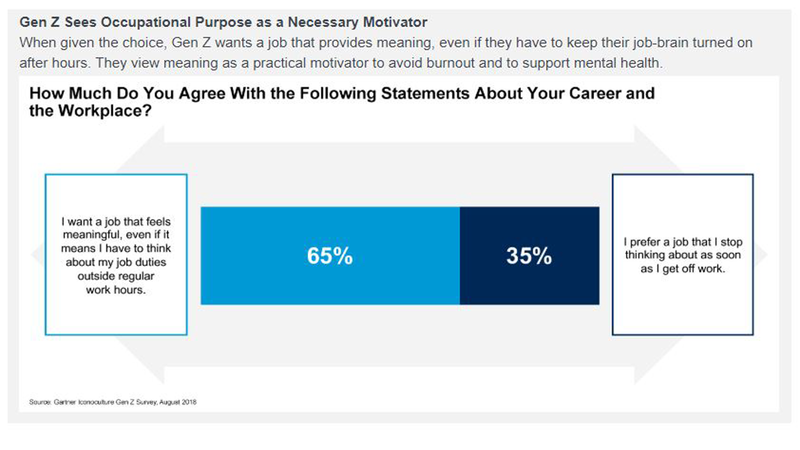 The key to connecting their engagement as employees with the engagement of customers lies in a consistent value that they’ve identified with since adolescence and show no sign of de-prioritizing now as young adults: purpose. Gen Z sees occupational purpose as a necessary motivator. In fact, 65% of Gen Z says they want a job that feels meaningful, even if it means they have to think about job duties outside of regular hours. They view a purpose-driven job rich with meaning as a way to be engaged at work, avoid burnout and to support mental health. While “purpose” and “meaning” are somewhat subjective, they’re generally the resultative emotions of feeling good by way of making contributions. Given Gen Z’s social and collaborative DNA, coupled with their practical, no-nonsense nature, they are pre-disposed to solving the unnecessary employee effort problem. According to Gartner’s CMO Spend Survey, 45% of marketing leaders cite customer experience as a “shared responsibility with other groups in the company,” which means that Gen Z in any department can be advocates for a customer-centric culture – which is necessary to advancing CX initiatives. Leveraging their way of working can pave the way to not only understanding them as a force of ideas in the workplace, but also to creating a culture that will resonate with them as a generation of critical customers to retain. For more consumer insights, reach out to Gartner for Marketers or your Account Executive.